River ‘improvement’ works initiated in the past century involved the removal of large woody debris - otherwise known as “snags” - for navigation, flood mitigation and in a misguided attempt to reduce bank erosion. This practice was one of the most significant forms of habitat degradation in NSW waterways. Efforts to re-snag are made more difficult due to the lack of large woody debris available. Historical clearing of riparian and floodplain vegetation for urban and agricultural development means that there is less timber for natural or intentional re-snagging. Even though a number of streamside areas are now being fenced off and revegetated, the natural input of woody debris into our waterways from these rehabilitated sites is decades away. 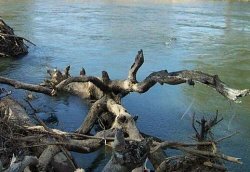 Removal of large woody debris is listed as a Key Threatening Process under the Fisheries Management Act. A Threat Abatement Plan has been developed which outlines management strategies for address this problem.